Have a monitor that's making weird noises or won't turn on anymore? Assuming you don't have a baseball-bat sized hole in your monitor, you could be a victim of the capacitor plague, a problem with certain types of capacitors that causes them to fail prematurely. 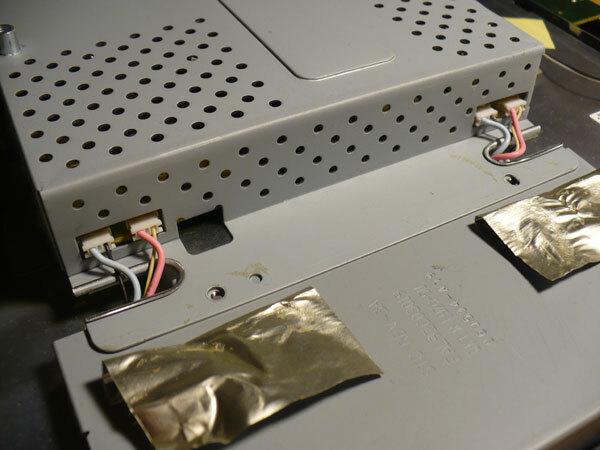 This guide is aimed at replacing capacitors on the power supply board of a Hanns-G HC194D monitor, but the general information here is applicable to repairing any type of LCD monitor. I have two HC194D monitors that both stopped working within a month of each other. 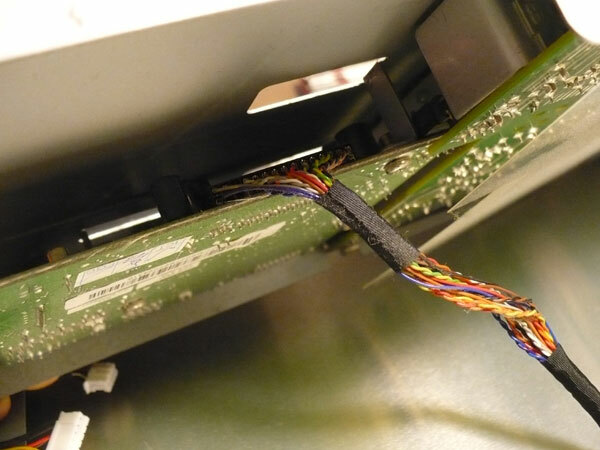 A quick search online revealed that the problem could be bad capacitors, and disassembling the monitors confirmed it. I ordered my replacement kits from a company called LCDalternatives through their storefront on eBay. I recommend LCDalternatives for their quality capacitors and reasonable prices. Whatever your monitor's make and model, chances are they'll have a kit specifically for it. You'll also need standard tools, soldering equipment and a fix-it mentality. Ready? Let's get started! 1. Detach the plastic base, and lay the monitor face-down on your work surface. 2. Remove the four screws holding the mounting piece that the base was connected to. The mounting piece should now slide out from the monitor. 3. 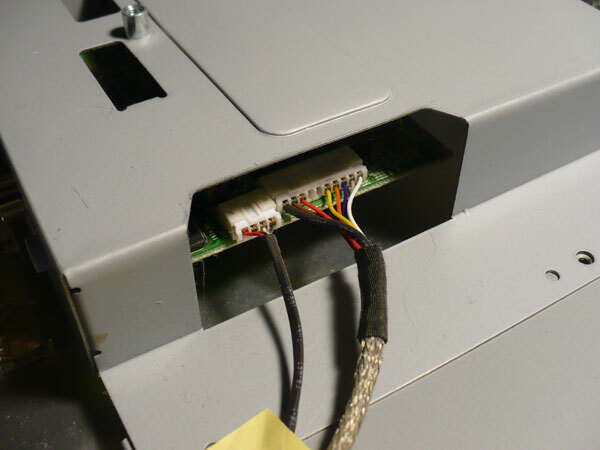 Remove the four screws holding the two halves of the monitor enclosure together. Use a flathead screwdriver to pry the two halves apart. 4. 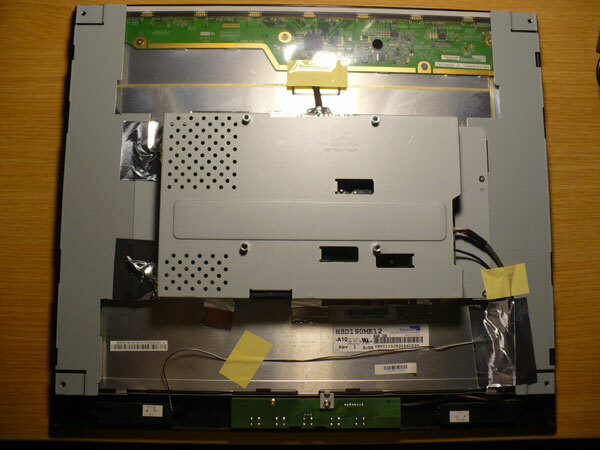 Remove the tape and the four screws that attach the power supply assembly, the large box in the middle of the monitor assembly. 9. 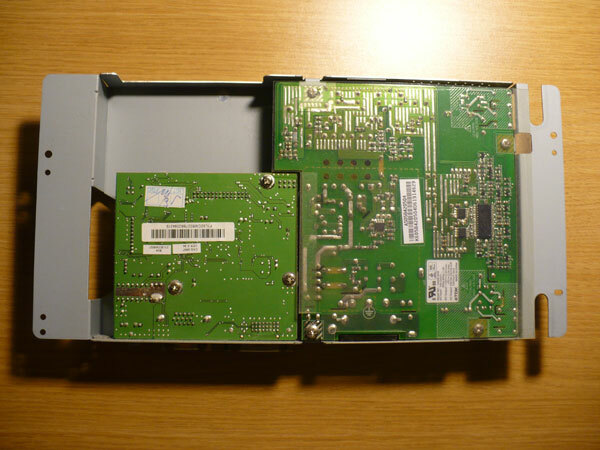 On the bottom of the assembly, remove the hexagonal screws flanking the VGA port and the DVI port. 10. Wiggle the video and power supply boards out of the assembly. Unplug the video board from the power supply board. 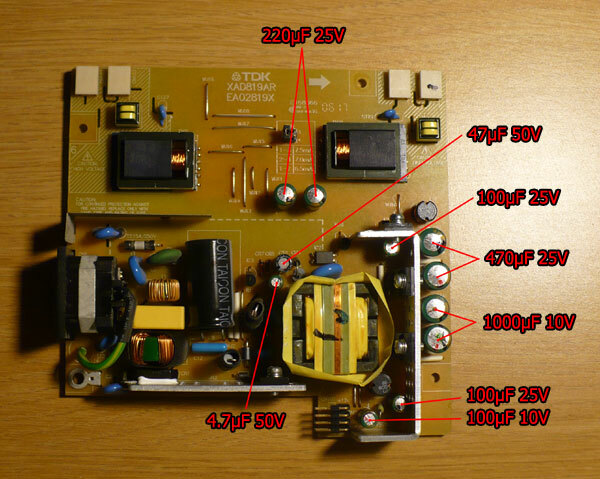 The capacitors we'll want to replace are on the power supply board. I haven't had issues with the capacitors on the video board. 11. Time to bust out the desoldering equipment. In addition to a soldering iron, it's helpful to have either a solder sucker or solder wick to remove the liquid solder during the desoldering process. Desolder the 11 capacitors (excluding the large black one, which probably doesn't need replacement) from the board. If you're having trouble melting the solder holding the old capacitors, this might be because the board acts as a heatsink, drawing heat away from the solder. Try heating the board on both sides with a hair dryer, which reduces the heat differential and helps concentrate more heat on the solder in question. 13. Solder the new capacitors to the board and clip the excess leads. 14. Now reinstall the power supply and video boards, and reassemble everything in the reverse order. If all is done correctly and the capacitors are truly the only things that needed replacement, your monitor should come back to life. If so, congratulations! I don't need to tell you of the benefits of resurrecting a dead monitor for $15 worth of capacitors over buying a new monitor for 10 times as much. Enjoy your (nearly) good-as-new monitor!